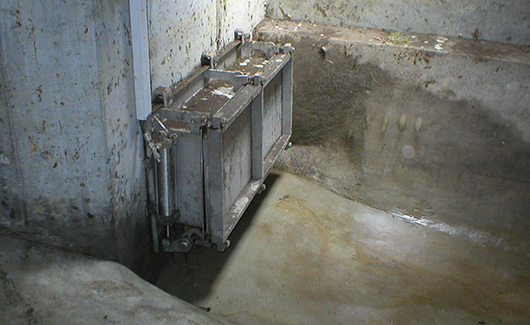 The ACU-GATE Flushing Gate System is a sediment flushing device designed to remove settled debris from storm water detention tanks, combined sewer overflow (CSO) retention tanks, sanitary sewer overflow (SSO) equalization tanks and reservoir floors, as well as sewer inverts, using a single flush. It has been used in CSO, SSO applications and can be used in agricultural and industrial applications to clean any batch process tank, reservoir or basin. The system operates by releasing a torrent of in-system water stored behind the flushing gate. The resulting flushing wave progresses down the entire length of the flush way, pushing the settled debris ahead of it. The re-suspended debris is then carried by the flush water to the treatment plant for disposal. The flushing gate system has several advantages over other types of sediment flushing devices. The ACU-GATE flushing gate is installed over a concrete opening, at floor level, located on a wall at the upstream end of the flush way. The mechanical components of the system consist of the hydraulic cylinder, the hinge and latch mechanism. The ACU-GATE flushing gate is constructed entirely of rugged stainless steel and has few moving parts, thereby assuring a long and virtually maintenance free life. The sediment flushing system can be installed in new tanks or easily retrofitted into existing installations. The following components are included in the ACU-GATE Flushing Gate System: the flushing gate, the anchoring system, the hydraulic tubing, tubing connectors, tubing support system, hydraulic fluid, hydraulic power unit and local control panel. The ACU-GATE flushing gate can vary from a model GAG-20 to GAG-240. The GAG-20 is designed to fit over a concrete opening measuring 16 inches high by 20 inches wide (41 cm x 51 cm) and the GAG-240 is designed to fit over a concrete opening measuring 16inches high by 240 inches wide (41 cm x 508 cm). The ACU-GATE’s model selection is based on the flush way width alone. The required flush volume stored behind the flushing gate is based on the flush way length and the slope of the tank floor or sewer invert. To date, the maximum flushing length has been 850 feet (280 m). The flush water storage area is filled whenever the tank is used. It can use either in-situ water or be filled with a secondary water source. After the tank or sewer is drained, the ACU-GATE flushing gate is ready to operate. The sediment flushing device is normally in the closed or latched position. Using electronic signals activated by the water level, the hydraulic power unit pressurizes the gate cylinder, thereby causing the latches to rotate to the open position. 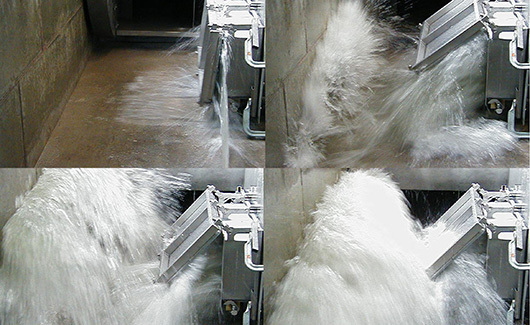 The hydrostatic pressure of the flush water stored behind the gate causes the ACU-GATE flushing gate to open, resulting in the release of a torrent of water which runs down the length of the flush way scouring all settled debris from the tank floor or sewer invert. Once the flush water storage area behind the sediment flushing device has emptied, the gate flap returns to its normal vertical position. At this point, the hydraulic power unit is shut off and the spring in the single acting cylinder returns the latch to its closed position thereby securing the gate shut. The ACU-GATE flushing gate is now ready for the next flush. The ACU-GATE flushing gate can also be operated using the water levels within the system with the use of a float powered hydraulic actuator, thereby requiring no external energy. The ACU-GATE flushing gate can also be operated using a pneumatic power system, thereby eliminating the need for hydraulic fluid. Located below the gate frame, the ACU-GATE flushing gate latches are completely protected from debris accumulation, by the gate frame. When unlatching, the mechanism rotates upwards so that additional clearance is not required below the gate. The ACU-GATE flushing gate cylinder is housed completely within the gate frame limits, therefore additional side clearance is not required.